Tamales are a celebration food! They are typical fiesta fare. Simply the tamale making process is an event in and of itself. In Mexican culture, tamales are made for any number of celebrations, Christmas probably the biggest time of year for gathering in the kitchen and putting a huge batch together. But I decided that I was going to make it a New Year ritual at Casa González. I mean, I'm not gonna deny anybody tamales if they want them for, saaaaaaay, Secretary's Day...but...you know. So along with my molé, I made tamales using said molé to ring in 2010. We just made a small batch, ~3 dozen...just mexi & I in the kitchen. But it is a load of fun to gather ingredients...family members, friends, neighbors, strangers walking their dogs...and make a tamalada (tamale making ritual...party before the party) of it! Pick through and soak your corn husks (in hot water) until pliable, ~4 hours. Cover with a plate to keep them submerged. Put your prepared masa in one large bowl. Put your prepared filling in another large bowl. Give yourself a good amount of space. Divide the tasks into stations if you're doing it tamalada style. Oh yeah, and while you're getting everything prepared, take a few of the corn husks and rip them right down the grain into thin ribbons for tying your tamales. Now, arrange your drained corn husks first, masa second, filling third and tying station last. Lay one husk flat, tapered end closest to you. 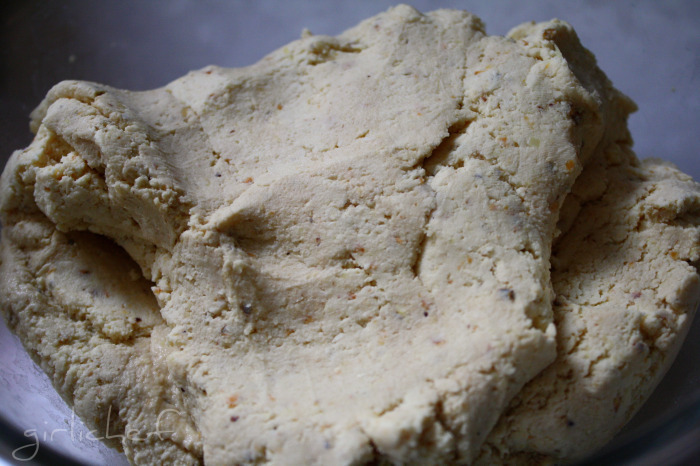 Put ~1/4 c. of masa onto husk and spread it into a fairly thin layer, ~1/4" thickness. Be sure to leave a good amount of space (~1 1/2")at the bottom for "sealing" and ~1/2 - 3/4" on the other sides. Spoon a good heaping Tbs. of filling down the center. Fold one side over and then fold the other side over that. Fold up the bottom and tie gently with strip of husk or string.Arrange the tamales, open side up, on the rack inside the pot. Oh yeah, don't forget to fill the bottom of the pot with water first. Repeat, passing down the line, if it applies, until you are out of ingredients. If there is still space inside the pot, just wad up a bit of tin foil and stick it in this space. This will keep the tamales from falling over (a tip I learned from the Master...you all know who that is by now. Right!? ).Turn on the water until it begins to boil. Turn down and let it steam, with the lid on, for ~45 minutes. You will be able to tell they are done when the husk pulls away from the masa easily. Let cool and refrigerate to hold. Reheat by steaming or microwaving...or fry some up on the comal...that'll give 'em crisp outsides...YUM! I love them that way. Course, I like 'em any way! 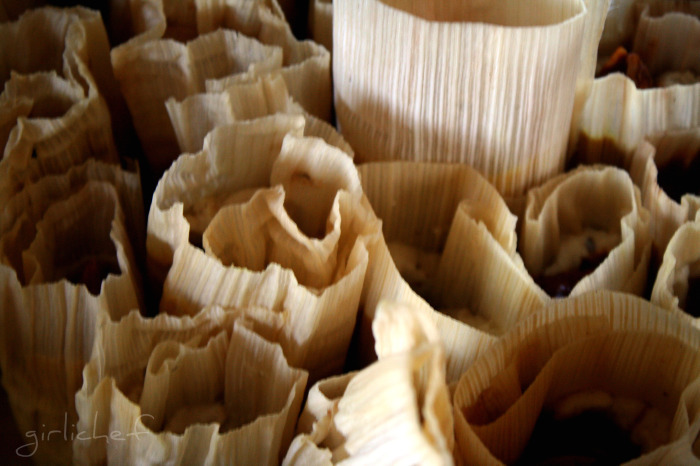 I am in the tamale making mood...so get ready for more tamales in the hopefully near future! You make it look so easy. By the way, Happy New Year! good job- you can definitely get married now! this tamales looks really good! Tamales are one of the dishes on my learn to do list this year. This looks fab! The saucy filling is so enticing! Ooooh, tamales...the mention of setting up stations makes this sound like a fun joint cooking project for my boyfriend and I to try in 2010! Wishing you a very Happy & Blessed New Year! I need to go to your house and eat. This recipe sounds amazing. Mexican cuisine is my favorite type of food. Tamales are the only food that I just can't wrap my head around making on my own when the wagon that sells them on the corner makes really really really good ones, and so cheap. First off love the philosophy party before the party. These look fantastic, why is it I alwyas learn something new here? Wow, these look phenomenal! Looks like they're fun to make too, especially if you've got someone in the kitchen with you! That's quite an undertaking...they look beautiful and delicious! I've never had a tamale but this makes me want to try one. oh wow can i come over and make them with you next time! 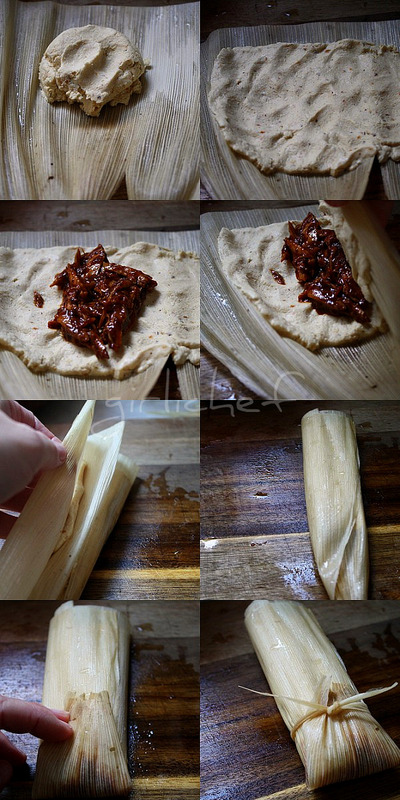 I love tamales and I'm sure I would love homemade tamales even more. I just can't get over the labor intensiveness part of it. Speaking of sending me something did I tell you I got the T-shirt a couple days ago? Thanks! Sure do miss having you at Our Krazy Kitchen! 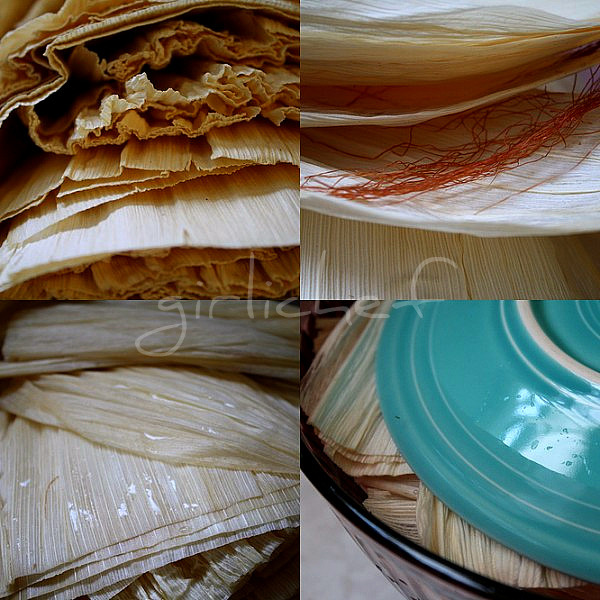 I'm still looking for good tamales in HK, if I could get corn husks, perhaps I should try your recipe! Thanks!! I've been wanting to make tamales for such a long time. Those look good. I remember former co-worker's mom would always make a bunch of tamales for the office whenever she was in town. I'd always devour two before lunch. hahaha... I'm definitely going to make some at home now. They look beautiful and absolutely declicious...YUM! OmiGoa ,i love these Heather,gosh u know even something v similiar,Tamales sound so good and u make 'em and picture great!!!! What we make here is a potuguese gaon steamed elcious Tamales kinda called 'pattoyo'. This looks absolutely delicious but I'm sure they aren't as easy as you make them sound (but your instructions seem very tempting. Hey!! Come on ove and I'll make you some bread and you can make me tamales!! Yes I could have tamales any day. There is a local restaurant that cures my fix. Who knows I may make them myself one day. Tamales have always intimidated me but you make them look so...doable. I would come over for a tamalada at your place any day! Heather, these are beautiful!! I hope you had a great New Year!! Tamales take so much work! What a gift of love! Beautiful pictures and tutorial. I need to make some, get the nerve. Thanks for the great instructions. Why does your Mexican always look more scrumptious than mine? Delicious, comforting and I would like to drop by. I fell in love with tamales last year, the first time I ever had a REAL handmade tamale. Yes, I got to 41 years old without ever have a real tamale. It's a crime. This is one of my favorite things on Earth. I just wish they weren't so involved to make. I've never attempted them but when I get that urge, I know where to come! Thanks! I have never had tamales before. They look awesome. Can't wait to try them, you make it seem do-able. Do you skin them before frying when you do the re-heat on the comal? I did not know hteese tamales thanks for the sharing ! I must try tamales; I've never eaten them. They look like a lot of work, but I'm guessing they're worth it. Great tutorial. You did it again. Another winner. I love your instructional photos. Those tamales look delicious! I have to make Mexican tamales soon.....I love my Colombian tamales too, but we use plantains leaves. This could've been a daunting project, but you look like a pro! I have yet to try *eating* tamales, let alone cooking them. Maybe I should make a New Year's resolution, after all! Girli, you are totally awesome for making these from scratch. A labor of love! Splendid! What a great tutorial! 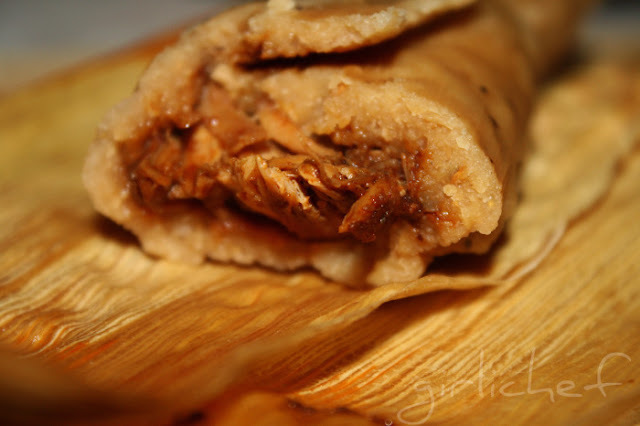 I haven't eaten a tamale since I lived in Tucson - and I've never made them! I shall have to try now! wow!! i love the idea!!!! :) hope you had a wonderful new years eve!! Awesome Heather! Those look soooo delicious! Thanks for sharing with us! We always made tamales the day after Thanksgiving, to have on hand for the holidays, (they freeze beautifully). Our beloved queen of tamales lost the battle with cancer and we have not had the spirit to make them in recent years. Maybe this will be the year that we honor her with tamales. Thanks for the inspiration. Tamales is one dish I've never tried to make...hmmmmm! And they always look so yummy and fun! Holy Hot Tamales!!! I have always wanted to try this but it just seems like so much work... LOL They look DELSH though... 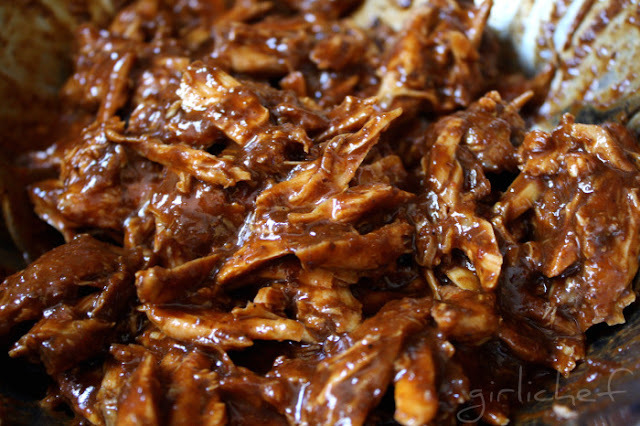 I am going to have to break down and do this... YUM! One of these days I may get around to making my own tamales but it is hard because there is a Latin mercantile that sells really good ones here so I lack motivation! ;-) Your tamales look delicious and I bet with the mole sauce they were incredible. 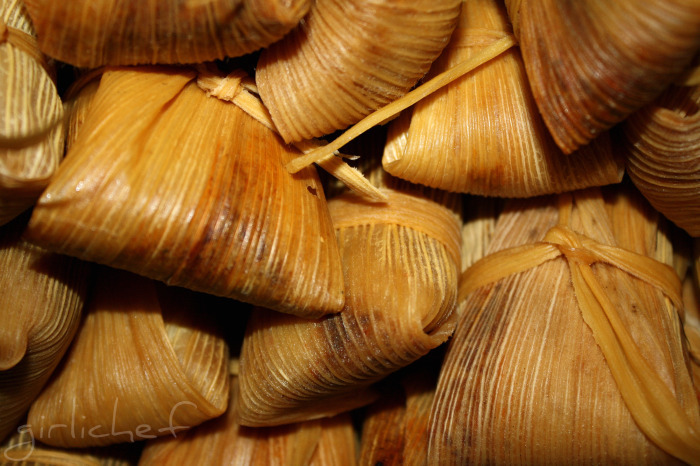 Mmmm...me loves tamales and these look especially satisfying! Love tamales! I need to make them at home someday!